Shirley Kazuyo Muramoto was born and raised in the San Francisco Bay Area, a fourth generation American of Japanese descent. Her mother is a respected head of the Chikushi Kai in Fukuoka, Japan. 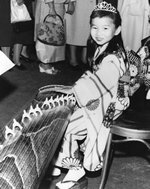 Shirley was taught within that tradition, learning and constantly performing the core of traditional pieces shared by all koto groups and also the repertoire particular to the Chikushi Kai. Importantly, it is a group which is also open to contemporary music for the koto. From that spirit of open-mindedness, Shirley also pursued her interest in jazz as it extends to the koto, and improvisation. In 1976, Shirley received her “Shihan” degree (instructor’s license) with “Yushusho” (highest) honors from the Chikushi School in Fukuoka, Japan, and her "Dai Shihan" Master’s degree from the same school in 2000 for her mastery of the koto. A dedicated musician for over 50 years, Shirley strives to involve diverse genres of art and music in her performances. She teaches private students, and has offered classes in koto music at public schools and at universities, most notably classes at UC Berkeley for about 7 years. Shirley has incorporated storytelling, poetry, hip-hop, gospel, bluegrass, jazz, European classical, and has arranged world songs from countries such as China, Ethiopia, Guatemala, Philippines for koto, as well as performing and arranging traditional and contemporary Japanese songs, and composing her own koto pieces. She also is the leader of the world jazz fusion group, the Murasaki Ensemble. Senator Diane Feinstein, George Lucas/Lucas Films, former Prime Minister Yasuhiro Nakasone, Walter Shorenstein, Larry Ellison, Christina Aguilera and Mikael Gorbachev. She has also performed at many eclectic events from the Fillmore Jazz Festival, Union Street Jazz Festival, the AT&T Golf Tournament hosted by Clint Eastwood, and the Sacramento Symphony. Shirley has performed at numerous community events, and given of her time to many of them, including the Cherry Blossom Festivals in San Francisco and Cupertino, many Obon festivals in Oakland, Palo Alto, Mountain View and San Jose, just to name a few. Because of her research in interviewing over 30 artists in connection with the practice of traditional Japanese arts in the WWII camps, Shirley is dedicated to the continuance of these arts in the United States, and continues to teach, demonstrate and perform in honor of this history and legacy. Shirley became the first koto performer from outside of Japan to qualify for the prestigious Kenjun Koto Competition, in 2018. 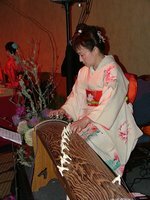 In 2012, Shirley was honored by the Hokka Nichibei Kai Japanese American Cultural Association of America by being inducted into the Bunka Hall of Fame for her life-long dedication to teaching and performing on the Japanese koto. She has also worked with advanced koto students in the Apprentice/Masters program presented by the Alliance for California Traditional Arts 2015, 2017 and 2019.